Steve Sparks is a 72 year old Cleveland Indians aficionado who happens to be playing in the MSBL’s Houston Hardball League, where he began his second baseball career in the mid-90’s. Steve is a much loved, enthusiastic baseball player who realizes every single day just how lucky he is to be playing baseball and won’t hesitate to infect those around him with his child-like enthusiasm. Steve is a frequent participant of the MSBL World Series in Arizona and was also a part of the Legends All-Star squad MSBL put together a few years back for an exhibition at Tempe Diablo Stadium during our World Series against former major league players and celebrities. However, in November of last year life threw him a curve ball. Steve was diagnosed as having cancer of the liver and lungs and given three to six months to live if he didn’t start immediate chemotherapy. He started treatment but the cancer has since spread to his brain, where treatment is also ongoing. Amazingly, though not surprisingly, this tough Texan is fighting this sentence full throttle and isn’t giving in. Close friends Ronny Stegall and Shaun Coleman have kept us in the loop regarding Steve’s condition. I asked them to please supply me with some testimony from his teammates regarding what Steve means to them as well as their warm wishes for recovery. We want to make sure that Steve knows how much his friends mean to him during this very traumatic period and also let him know that the entire MSBL nation will be conveying their thoughts and prayers and their wishes to see Steve coaching third once again for his beloved Houston Hombres of the Houston Hardball League. “Friday morning, November 18th, I began to wake up and as I was rolling over in bed I felt probably the worst pain in my lower back that I had ever felt. At first the thought was that it was a severe muscle spasm and with tests and treatment things would get better. That was when the testing began. Long story short, I was diagnosed as having both lung and liver cancer, a pretty far cry from a muscle spasm. That following Tuesday I met with my oncologist to review the test results. I have what is called “Small Cell Lung and Liver Cancer.” This type of cancer is very fast moving and without treatment I would be given about three to six months to live. Well, it’s something I cannot accept so today we began a plan of attack. Whatever happens we move forward from there. Am I surprised? No – not really, but it’s not something I don’t think any of us wants to hear. This year will be my 29th/30th year in the league. Over those many years of chasing my childhood passion for playing baseball there have been several characters on the field that come to mind. One gentleman in particular would drive me crazy for not adhering to the practice of playing in uniform. It seemed he always wore something that would not be part of the team uniform. It could be the hat, the socks, the jersey or the Indian Chief that he placed on the field during practice. Truth is, I’m a Detroit Tiger fan and I really never liked those Indians while growing up in Detroit. One thing that I could not dislike was this guy’s passion for playing the game. In most over 55 leagues there is always a team where the over 65 players go to find that one last great play. In our league it is the Hombres. It is there where I really got to know the man behind the mismatched uniform while displaying his love for the Indians. I learned that this was a man who best demonstrated why we play this game, win or lose. A true gentleman and man’s man on and off the field. My first year in the league was 1997. It was one of the last Indians game of the season and Steve had already been planting the seed for me to start playing again. He had been playing again for about five years and he finally talked me into coming out to that evening’s game…Indians vs. Braves. In my first official at bat in about 20 years I struck out. But I was mildly content that I lined a hot shot towards the first base dugout for strike two and rattled the opposing team. But the bigger revelation to me was that I just became a courtesy runner for the catcher that batted behind me, who promptly launched a single. Oops, somebody forgot to disclose the courtesy runner philosophy to me. All of the sudden I’m on the bases for the first time and trying to decipher the signs that Steve is flashing from the opposite side of the field. Was that a “hit & run?” Did I get that right? I took off on the next pitch…success, in that the batter drove one to the alley. I made it over to third and still had some gas in the tank. So now as I approach third, Steve is waiving me in, since the ball wasn’t played cleanly. As I look back to see where the ball was, I hit the bag awkwardly and my legs were now telling me that I was in trouble. I stumbled with my upper body listing at about 40° and down I go, a complete chest-thumping, helmet flying, face full of dirt. I basically crawled back to the third base. Safe. I’m able to get just enough dirt out of my face to barely make out a figure running over to me and helping me up – Sparks. When I first started in the league I played against him. He did not know me from Adam. I uncharacteristically had a good game and hit a home run and also got a couple more hits and actually did not make an error. That in itself is a miracle! After the game he talked to me. He said “You are new to the league and just wanted to welcome you. Great game tonight. Just don’t have another like that against us.” Of course he laughed. Then over time, like all the rest of us, we became good friends. I wish the best for him and pray about him often. Steve has become family to me and my children. When I first started playing in the Houston league I didn’t know anyone and hadn’t played baseball in at least 15 years. Steve was the manager of the Indians, the team I was playing for. I could only make some games as I also coached my son’s Little League team and played softball on the weekends. Steve went out of his way to make sure my kids had gum when they were at the games. He also helped me attend my first MSBL World Series in Phoenix. Watching his attitude game in and game out, it was never about winning, but about playing a game that he loved. It has been a pleasure of mine to be associated with Steve over these last 13 years and I consider him more than just a friend, he’s family. I know he loves the game of baseball and has devoted many years to the Houston MSBL. This man is a Hall of Famer in my book, both on and off the field. Steve got me to go to Las Vegas in ’11. I know we didn’t do that well, but Steve did have the guys autograph the ball I got hit #102 with. This was just after the article in MSBL Hardball Magazine that claimed my being hit by a pitch the most. I still have the picture from us under the Las Vegas welcome sign. 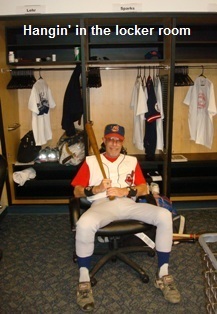 I also still have his picture in his Indians outfit from the Cincy/Indians park in Goodyear. He was especially proud of getting his picture taken in the clubhouse. I lastly have to thank Steve for the picture of me pitching with the A’z in Phoenix in a stadium game. My wife had it blown up and framed and is displayed in our house in Asheville, NC. Steve is one of my favorite people in the whole world. But I’m preaching to the choir, right? Here is one of my favorite Sparks adventures. Out of the blue I got a call from Steve. We all know what a huge Cleveland Indians fan he is. “Hey Tony, guess what?” he says. “I’m gonna go play at Progressive Field in Cleveland.” I said, “Wow, Steve that’s awesome. A chance of a life time.” He then started telling me all about it. How you get to play numerous games on the field, dress in the visitor’s dressing room with a locker with your name on it, trainers, food, etc. I told him it sounded like it was going to be a lot of fun and a great experience. He then said “Tony, you know what’s going to make it even better? You are going with me!” I didn’t know what to say. He had paid my entrance fees and all I had to do was get there. Needless to say it was an amazing trip and tons of fun. It was great having that one on one time with such an amazing and kind individual. He’s a special human being and definitely one of God’s great triumphs. The world is a better place with Steve Sparks in it. I am so blessed to call him friend. “March 29th I had a seizure as a result of the cancer moving into two spots on my brain. Normally not a big deal because there is not much there anyway except baseball and my family, but I guess they felt it serious enough to keep me in the hospital for the next couple of days. Since that time, with the great help of my oncologist and his team, I seem to continue to make progress. Radiation of the brain is now complete and in the next couple of weeks the attack will be back on the cancer using Optivo. My physical therapist says that I am making remarkable progress so I think all is heading in the right direction. The one thing I can’t seem to get out of my mind is my Hombres Baseball teammates and their wish for me to be there. You all know how important you are to me. I feel that way about everyone.